Hep B United, a national coalition co-chaired by AAPCHO and the Hepatitis B Foundation, addresses the public health challenge of hepatitis B. The goal of Hep B United is to support local community coalition efforts across the United States to increase hepatitis B awareness, screening, vaccination and linkage to care for all high-risk communities. Raise the profile of hepatitis B and liver cancer as an urgent public health priority. Increase hepatitis B testing and vaccination, particularly among Asian Americans and other at-risk communities. Improve access to care and treatment for individuals living with hepatitis B to prevent end-stage liver disease and liver cancer. Learn more about AAPCHO’s hepatitis B policy efforts here. 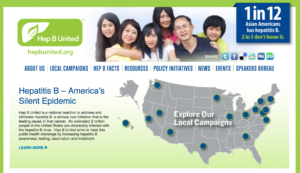 To learn more about Hep B United, visit: hepbunited.org.